Hordes io is a game that is a lot of fun to play as there are different aspects of the game, from joining and creating a clan, picking classes and factions to joining a clan. Players of Hordes.io get to gather loots and gold, attack moving items and join clans. What players get to do depends on their factions and clans. The game involves fighting monsters, fighting other players, farming for items, selling off items when required and maintaining fame levels. Players get better suited to their roles with more experience. While creating game characters, you are required to choose factions and classes. The classes available in the game are archer, mage, warrior, and shaman. The different classes have different abilities and perform different tasks during the game. The mage and the archer are the damage dealers. The warrior is the tank and has a bit of healing abilities, while the shaman is the character with the main healing ability. Players are also expected to choose between the two available factions before starting the game. The player factions in Hordesio are Vanguard and Bloodlust. As a player, you can attack players of opposite factions and join clans with players of the same factor. Clans are for interaction with other players, and you can create one or get invited to join one. Players of the same faction can spawn into same bases. The four servers of the game hold two bases for enemy factions and friendly factions. The choice of the faction is a major one as it cannot be changed for a character. However, you can create other characters. Hordes.io can be played in two combat modes: player versus player and player versus environment. 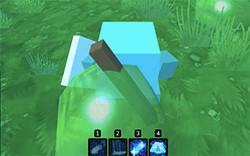 The player versus environment mode allows players to collect items undisturbed by other players, while the player versus player mode allows combat between players and is more risky and fun. The more wins a player has in the player versus player mode, the higher the fame of the player. Players are awarded crowns and helmets as their fame increases. Players with the highest games are also featured on the leaderboard, and they also get more attention from other players. You are required to create a unique character name if you intend to join a clan. Character names cannot be changed, and players need to be at a minimum of level 10 before they can name their characters. You can pick items after killing monsters and sell them off as required. Y ou can move your character with the WASD key. You can also change the vantage position of your character by holding the mouse click and dragging it down the screen. You can also move your character forward by holding the mouse. When targeting and attacking, you can click on the enemy and press any of the attack buttons 1,2,3,4. The suitable attack button depends on your class. You can also auto-target your enemies. You can set your character to auto-target your enemy by using the desired ability keys or using the tab key before an ability key. You can pick items after killing a monster by going close to the item and clicking on them. Experiences are shared when two players kill a monster.